Everybody is talking about the forthcomming universal avatars, wich are able to enter mulitiple metaverses. While all of you and the hole IBM developers crew had their christmas holidays, the allways buisy and never sleeping Jan and Tobias from the 24/7 and "one step ahead agency" YOUin3D.com did heavy research and tested the new Avatars !! Click here to watch them at work!! Tnx to LunAr Bailey for creating the highly textured costumized avatars! Good work! Als erster IT-Begriff landete „Second Life“ auf Platz 7 der Liste. Dabei bezeichne das „Second Life“ nicht nur die gleichnamige Internetplattform, sondern „in erster Linie die neuen Möglichkeiten des Internets, in einer virtuellen Welt sozusagen ein »zweites Leben« zu leben“, so die GfdS. "The World Wide Web will soon be absorbed into the World Wide Sim: an environment combining elements of Second Life® and Google Earth®." Ich will mehr solche Filme sehen!! What to share your Second Life® experience with someone else? Or represent your self to your SL clients using your avatar? Joo, we haben gefeiert am 7.12.07, siehe Flyer. I Myself not! But our Myspace profile http://www.myspace.com/berlinin3d ! It has been added the 400th time last night. A wild mixture of Avatars, SL™ Projects, Real Life Berlin stuff (clubs, bars, city districts e.g. Prenzlauerberg, agencies, art projects, radiostations, magazines, bands,...) and many, many, many private Users are on the list. Die Anzahl der Gruppenmitglieder spiegelt sicher auch die Beliebtheit der SL Präsentationen wieder. Schliesslich tritt man in SL einer Gruppe freiwillig bei. Funny frisch auf Platz 4 liegt in meinen Augen z.B. sicherlich an der hervorragenden Umsetzung. 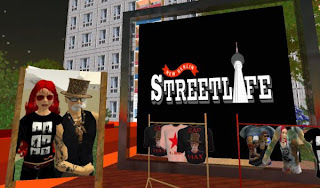 Das unsere Second Life® Gruppe "newBERLIN_Streetlife" so gross ist, haben wir aber natürlich vor Allem unseren Inworld Community Managern Zap Hax (er ist Gründer der Gruppe) und LunAr Bailey zu verdanken... !! Und wir stehen mitten drin!! 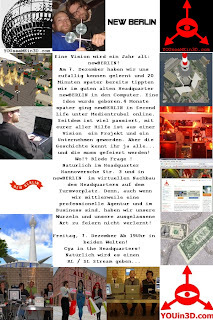 BERLINin3D.com linked on official Second Life Page! Gibt es denn immer noch keine kugelsicheren Westen auf slexchange !? And, yes, we shortened our Name from YOUseeMEin3D.com to YOUin3D.com ! Maybe you can keep this a lot easier in your mind!! To meet the increasing demand for Web 2.0 comprehension and skills, and to build a broader European Web 2.0 community, O’Reilly Media and CMP Technology have launched Web 2.0 Expo Berlin to take place 5-8 November, 2007 in Berlin, Germany. A companion event to the Web 2.0 Summit, it is the conference and tradeshow for the rapidly growing ranks of designers and developers, product managers, entrepreneurs, VCs, marketers, and business strategists who are embracing the opportunities created by Web 2.0 technologies." Second Life -the web 3.0- kicks in when web 2.0 really is developed and they start talking to each other. So we all work on a frame where user can paste in tools to fill this frame with thier content? and MAYBE the BCC (Berlin Congress Center) would be the much better place for this event? "Wir glauben an offene Systeme"
Here i ran trough the picture at "First and Second City"
this story was born on 06.dec.2006.